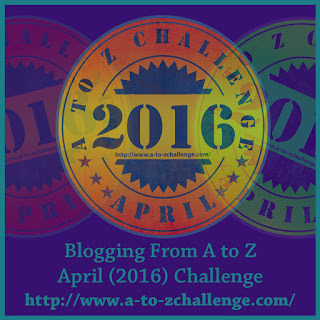 TfN: Day 8: And On The 8th Day It Was Done! It may have been the last day of the tour but it still was an early start. 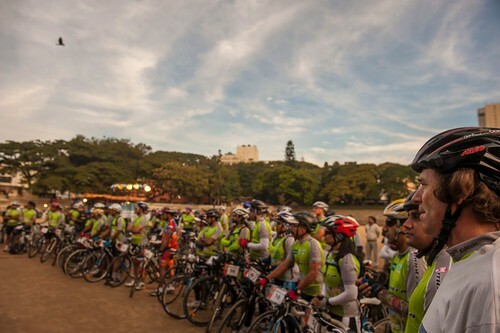 Breakfast was served at 6:30 and by 7:30 cyclists were all geared up, standing with their cycles, itching to start. Today’s road led home and everyone was eager to get going I guess, it’s been a great tour but home was calling. Or maybe it was the route we were to travel today – a mostly flat and fast competitive followed by the Sathyamangalam forest ghats. Standing by watching the cyclists gather I noticed Naveen doing a pre-ride check of his cycle and moved towards him. This is a joy to watch, especially the part where he adjusts his rear derailer. He lifts the bike, gets the rear wheel spinning and listens to the gears shift. Then he tweaks a nob and listens again and repeats until he is satisfied. When he’s done the gears switch soundlessly. It’s like watching a musician tune his guitar! Flagged off the cyclists headed out towards the competitive section start 12 km away at a comfortable pace. Everyone was conserving energy for today’s last and final CS. A 21 km long, relatively flat section, passing through three villages that would be a blast to ride. 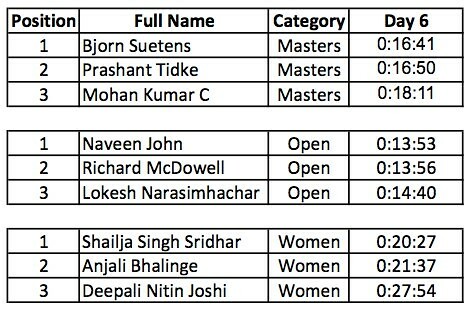 For those seriously competing, today’s timing would affect their overall standing so it was a ride hard, ride fast day. Chasing the riders, we set a fast pace to out race them to the CS finish. It was a day to capture dramatic finishes. Passing the CS start we saw Peter start off on the section and gunned the engine some more to cover the 21 km quickly. We managed to get a good lead and bought ourselves enough time to comfortably set up shop before the cyclists started to arrive. And boy did they arrive! After the first cyclist crossed the finish line, the rest followed quickly and by 9:30 all 70 cyclists had completed the CS section. This was probably the fastest CS section completed by all riders. The CS complete everyone was now on a relaxed ride. The Satyamangalam ghats lay a little way ahead but our first stop was an eatery at Bannari where we had chai and the cyclists ate pre-lunch 😀 Energy recharged we started off on the climb up to Dhimbam through 27 picturesque hair-pin bends. The cyclists stopped quite a few times on the way up, some to take a moment to soak in the views and others to catch a breath. Not that we were complaining, after all we got more photo opportunities. The Satuamangalam forest is famous among other things for Veerapan the Bandit who was lived and looted here. Starting out as an elephant tusk poacher, he soon became a sandalwood smuggler, a most wanted man and even a celebrity kidnapper. While he lived and was at large here, this road had been closed for years. But now we can climb through this green dense forest gaining about 1100mts. over 14km to reach the lush green Dhimbam ghat. And so, we climbed. Right at the top of the ghats just before you start to descend is a chai shop. I remember stopping here a few times for a chai and pakoda. It’s a perfect mid point stop in the forest. But this time we stopped just a little ahead at SS3. Since this is a narrow down hill road we didn’t stay long and headed on to SS4 where we would get lunch. Every one seemed hungry this morning. This was the last of the hills we would see for now. Here on it would be flats all the way to Bangalore and we all wanted to enjoy what was left as much as we could. The cyclists stopped often and we descended slowly. But no matter how much you stretch it, there is only that much that you can stretch and before long we were at SS4. SS4 is just round the corner after crossing into Karnataka. From the moment we saw the Welcome to Karnataka board we braced for impact, we were expecting huge craters. Karnataka roads are legendary for their badness, especially at borders when you’ve been driving on kilometers of good road in another state. 100 meters into Karnataka we were still holding on, only now we were peering ahead to see when the potholes would start. And we were still waiting a while later. Surprise of surprises there were no bad roads. When did this happen here? Reaching SS4 really hungry at 12:45 we headed straight for the food. There was pulaiogare rice and curd rice, wasn’t exotic but it was simple and soulful and we ate like pigs. Walking around after lunch I turned suddenly when I heard a thud and people cry out to find Venky sitting on the ground and a bull standing in front of him. The close face to face encounter came about when Venky startled the bull and tripped over when trying to step back. The stand off was long enough and strong enough to have had Venky hidding behind a tree for quite a while surrounded by peals of laughter. Leaving the last support station of TfN 2012 reluctantly, we continued on towards Chamarajanagar which is named after Chamaraja Wodeyar, King of Mysooru who was born here. From here we head back to Bangalore; for the cyclists the ride ends and so does most the suffering but here on the bragging begins! But it all didn’t end so soon. Cyclists had already started arriving when we reached our destination in Chamarajanagar at 2:30. There was a lot to do before we left for Bangalore, cycles had to be packed, cyclists to be freshened up with food and bath, results to announced and prizes to be given. So everyone got to doing something. By 4:30 everyone settled down to hear the results. But before that, it was time to put names to faces we had all seen through the last 8 days (even I didn’t know all the volunteers by name). There loud cheers and whistles as Francis introduced all the different teams and it’s members that made TfN 2012 possible. Cyclists were asked if they had any suggestions for the next year and every cyclist was univocal saying “It was already the best.” Two suggestions did emerge though – Ulhas Joshi who had come from Pune requested for more mountains less plains and Dr. Nishith Shah asked that the next time flats be explained better since in the South flats are more rolling flats but in Gujarath flats are flat. Finally it was time for the results. 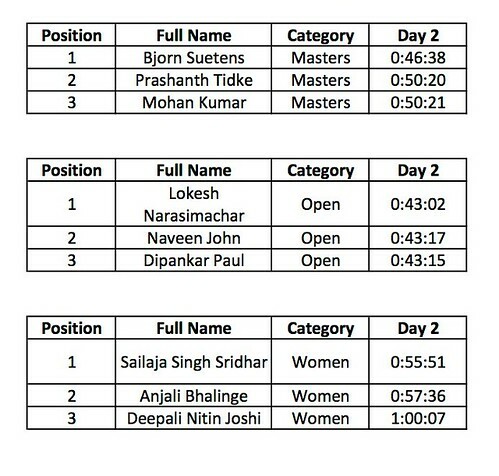 Here are the Winners for Tour of Nilgiris 2012. After all the hurrahs, cheers, email exchanges, facebook connections, and sad goodbyes we boarded the buses at 6 pm heading to Bangalore. It didn’t take too long for everyone to fall asleep only to wake up at the dinner stop. Bangalore wasn’t very far away now and I was so looking forward to my body-shaped bed. Che and I ate a light dinner and after much contemplation gave up on the dessert idea, we figured we should be good at least on one day of the tour. 😉 We made good time and reached Bangalore at 10:30. But this was not the final goodbye, there is still the TfN cool-off party tomorrow! 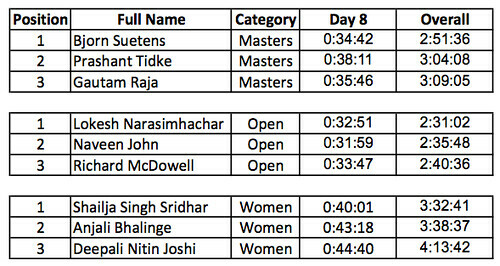 If you haven’t seen Venky’s rider reports of TfN 2012, you should. Here is the Day 8 report. Locals overheard at CS end – Husband: Looks like people from all aver the world have come to cycle. Wife: See, and how many times I’ve told you to buy the kids a cycle. The first ever French cyclosportive was La Marmotte, which was first run in 1982 on a route starting in Bourg d’Oisans and finishing at the top of one the most famous Tour de France climbs at Alpe d’Huez. It is one of the most popular cyclosportive events today and is often considered to be the hardest cyclosportive. Door Prize is a term used when a rider collides with the open door of a parked car while cycling. Started way back in 1930 in Dehradun The Himalaya Drug Company today serves the health and personal care needs of consumers in 82 countries and is endorsed by over 300,000 doctors around the globe. Today we bid goodbye to the Blue Mountains and head down to Mettupalayam a fast developing town that has established itself as a hub for trading fruits and vegetables from the hills. But that is not it’s only claim to fame, the Ooty steam train build during the British period (the only rack and pinion railway in Asia) starts from here and runs to Ooty through 16 tunnels, over 250 bridges and 46km of forests and tea plantations. Since we didn’t have much distance to cover, just 60 km and most of it downhill, we were starting late. That would have been a wonderful thing if only breakfast had been early 😉 After a late breakfast we lazed around talking to cyclists as we waited for the volunteers to find a free moment for a group photo. At about 11 the first cyclists started to leave and we headed to our room to quickly grab our bags and follow them. That was supposed to be a simple enough thing to do but it landed me in a mini heart in my mouth situation. Just by the stairs we ran into Kiran who asked Che to click a photo of him riding down the stairs. Che said ok and walked down to position himself while I just stood there with my mouth open, only recovering just in time to fumble and capture this video. Leaving Sterling Fern Hill we headed into Ooty town towards Kotagiri. Around here every place has two or more routes to get there so we were following the road markers carefully but Jayalalitha seemed to be visiting today so the town was a mela of sorts and we must have made a wrong turn because before we knew it we had gone a very long way without seeing a TfN marker. Back tracking we alerted two cyclists also on the wrong route and headed back into a traffic crawling town to get onto the right path. Finally on the right route we took off towards Kotagiri hoping to catch up with riders. Last night over dinner Venky and Siva had said that the route doesn’t take more than 45 minutes non-stop. 60 kilometers in 45 minutes was fast, we thought we’d never catch up with them but that wasn’t how it turned out. The views were so spectacular that the cyclists stopped at just about every corner. We met them just around the bend and then again and again down the hill. Stopping a few times for photos we reached Kotagiri and drove through it. I remember Kotagiri from 10 years ago when it was a large village, now it seemed to have grown larger, expanding at its seams. Time doesn’t stand still even in the mountains. Dropping Chethan off at one of the bends we moved ahead to a spot 2 km further down where Che and I settle down to wait for cyclists. It was a long wait, the cyclists were taking a slow pace and stopping often today so we waited almost 2 hours. But it wasn’t boring at all, we had landed at the time of tea leaf collection so all the workers from the estate came onto the road with their load of leaves and weighed in. Watching this motley crew ranging from young to quite old crack jokes and laugh as they worked, I couldn’t help but smile along. The waiting two hours paid off, we did see a few cyclists and got delayed enough to catch up with a batch that had taken a detour to Kodunadu View Point too. The KYNKYNY team made our day by coming round a bend in top form, watching these guys ride in a pack is almost like watching a ballet performance, they don’t cycle, they dance. Hungry we headed towards SS3 to grab lunch but even in our hurry we took time to enjoy the mountains. We were leaving them today and as if in a final flourish the mountains were throwing views and bends at us that made want to never leave. As a final parting gift just a bit before SS3 we spotted a bison, remember the ones we missed capturing yesterday? Well this one stood eating a little about the road for a long time and didn’t give two hoots about us. Cyclists were doing good time today. Most of them had reached SS3 by the time we reached for lunch. I thought the pulao was good yesterday but today topped that with yummy pasta and gulab jamun. 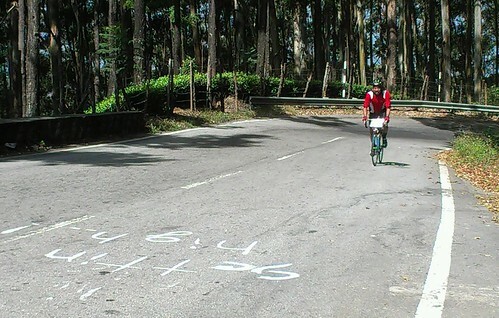 By 4:30 SS3 started to wind down, there were only 4 cyclists left. There was no Competitive Section today so the top 3 are the same as yesterday. Venky and the cyclists had a ball coming down the hills today. You can read his side of the story. “Its very soft, it takes everything off.” – Vivek when asked about the Johnson’s baby wipes he uses to wipe down his bike. The London Ambulance Service has recently introduced bicycling paramedics, who can often get to the scene of an incident in Central London more quickly than a motorized ambulance. Marks of road rash on a cyclist’s body are called ‘Bacon’. ‘Brick’ is a rider who is a slow climber but an efficient descender and ‘Kite’ is a rider who climbs very well but is a poor descender. ‘Squirrel’ is cyclist who has a tendency to swerve unexpectedly and maintain inconsistent speed and ‘Vultures’ are race spectators who garther at a technical point of the course where a crash is more likely to occur. Faster, lighter and stronger than any cycle ever created in India, Montra brings international standard carbon frame bikes that are designed and manufactured ingeniously for the first time to India. Montra, meaning “My Track” is the bike that lets you ride our your aspirations, that lets you choose your own path. 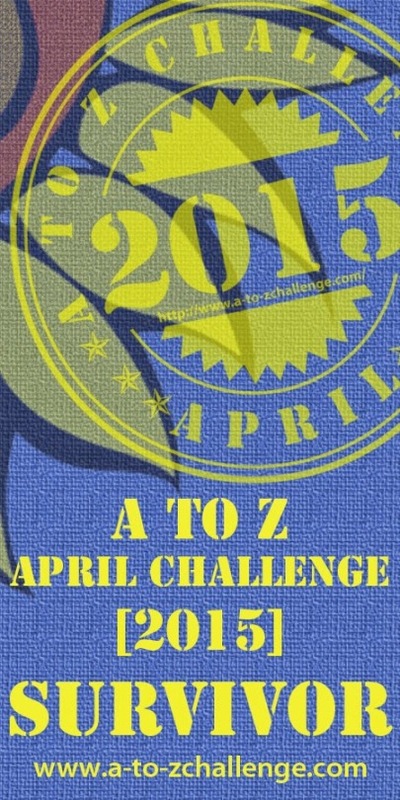 Day 8: And On The 8th Day It Was Done! Tonight also we stay in Ooty but today’s day take us to Upper Bhavani into the Korakonda Estates before we return to Fern Hill Resort. The ride planned for today is one of the most gruelling routes on TfN this year, especially since the downhill hair-pins that the riders enjoy on their way to Upper Bhavani, will be the same ones they will have to climb on the return in the competitive section today. Upper Bhavani and the route to it is a treat to the eyes with pristine tea estates along secluded winding roads. Forests are usually shrouded in mist and they take you back to those spine tingling horror flicks with things around hidden foggy bends. But today we had no fog, no mist and largely clear skies. When we did see mist on mountain tops ahead of us and chased them, we were never successful. The mist eluded us today but it did make for some beautiful sky shots. Leaving after the riders we started our day on the road at 7:45 and headed toward Emerald Bazaar. I settled down into the front of the jeep with Satish looking forward to the 68 hair-pin bends I had been promised while Che and Chethan geared up in the back to begin shooting. I didn’t stay settled for very long though; chasing the cyclists a few kilometers out of the resort we ran into three huge bison walking along the road. We jumped or rather I jumped as they were right by my window. My feathers ruffled I watched as we in turn startled the last bison in the line who took an animated little startled hop without thinking but still landed goat like on the culvert. You remember the size of a full grown bison don’t you? Gawd that was nimble! In our worry for the cyclists right behind us we forgot all about taking a photo of the bison. And by the time the cyclists passed and we turned around to take a photo they were gone. But our and the cyclists affair with animals didn’t end here, we ran into a herd of cow and then into a herd of buffaloes that spooked when they saw the cyclists and started running ahead of them. It was a sight! And then ahead into the hair-pin bends we met our first rider on the way back. We stopped in shock and then stopped her too! We wanted answers how had this happened, where had all the other riders gone, we hadn’t seen them; was the route so short as to be done in 2 hours. Only after Anuja removed her earphones did she realise she had got turned around somewhere and that she had been telling riders she passed earlier that yes, she had finished. 😀 Oh poor riders, they must have been so psyched! Just day before yesterday the markers team had given me a mini heart attack about the bad roads and today they did it again. We came across a road marker that said ‘Bad Road’ and just ahead were some bad potholes with a message ‘No Kidding’. I breathed a sigh of relief, that was the end of the bad road but alas, just ahead was another message – ‘Seriously’, that was followed by 4-5 km of bad road. Just you wait Markers, Just you wait! Having finished the 34 hair-pin bends and the bad roads with a few more bends we entered Korakonda Estate and reached SS3. We were running low on diesel and were hoping to find some here but there was no diesel here and the only other place was Manjoor all the way back we had come. Time and fuel being of essence we headed back stopping for a bit at the waterfall hoping a cyclist would come by but no one did, so we continued on until we spied Che crouched by the road side taking photos. Che wanted to take some more photos in the area so Satish and Chethan headed down to Manjoor to fuel up while I hopped off the ride to walk by Che. (Cheesy I know but I couldn’t resist) We had a ball – a warm sun, a cool wind and views to give-up everything for; what more could we ask for. We walked along the road looking for possible photos and framed cyclists in them without noticing time or distance. Before we knew it an hour had passed and so had 2 kilometers before we spied a volunteer vehicle and hitched a ride. Passing SS4 we headed on quickly to the CS start at Kundah Bridge to grab lunch and regroup with Satish. Kundah Bridge is just ahead of the 21st hair-pin on return and the CS today was a 4.2km uphill through 11 bends ending just after the 10th. We had a good packed lunch (one of he best until now) of pulao as we watched cyclists take off on the CS [sorry cyclists :)] Entree riders also joined us today but they had the option of doing the CS section without competing. This CS was a tough one but even then Naveen clocked the fasted time of 13 something minutes. Taking pictures from the jeep we continued our journey back to the resort to catch up with riders who had already reached. Man, some guys were really fast today, the first batch of riders reached SS3 (the turn around point) at 10:30 this morning! I wonder if SS3 was even set-up yet. I had a memorable day today, not only did I spend a day roaming the hills that I love doing 68 hair-pin bends and more (you should see it, I have Rudolph’s nose right now) but I also saw riders fall, only to stand right back up again and ride, I saw riders stop to help the fallen, riders who were doctors practice their art by the road and the cherry-on-top was riders using newspaper inside their jerseys to keep out the wind! It works, I know, I’ve used that trick for years. Tomorrow we head out of the hills into the plains again as we go to Mettupalyam. It’s an easy day on the legs but the traffic here is tricky and everyone’s gonna have to be on their guard. 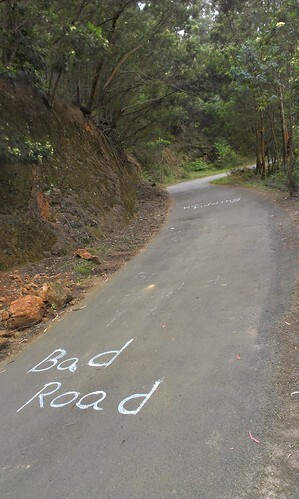 And before you go, don’t forget to read Venky’s rider version of the climb today. In the United States, Americans spend over $81 billion a year on cycling gear and trips. The situation where a mechanic in a support vehicle will appear to be making adjustments to the bike but in reality they are giving fatigued riders a break by holding onto the car and getting a massive push-off when the commissaires get too close is called a ‘magic spanner’. A ‘sticky bottle’ is when a rider holds on longer than necessary while taking food and water from the team car during a race to give himself a moment to relax. The Ride a Cycle foundation aims to create more cyclists and bring more cycles on the road through various programs. TfN is one of them! It’s been a quite day today on the TfN tour. Some cyclists had gone into Ooty while others were resting or catching up with friends. It’s been quiet on all fronts. 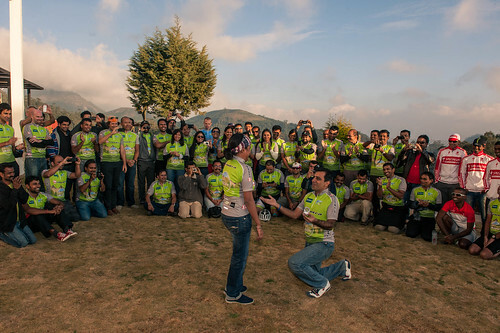 The only highlights of the day being Ashwin’s proposal to Usha just before the TfN group photo and the Entrée ride. Remember the Timing Turk who stuck that camera in my face on day 2. Well, Vasu’s done a quick write up about cycles seen through the years at TfN. Now with my theoretical knowledge of cycles this is something I cannot do or atleast not anytime soon so, go on, read the Timing Turk’s take on it. In the first year of TFN we had the beautiful Colnago bikes. Of course the star of the tour was Rajesh’s red bike. I am forgetting whether he was riding the Colnago – Ferrari or whether it was the Pinarello. That year most other bikes were either Trek or Merida MTBs. Then there was a Specialized – Seema Tiwari and Vivek’s (Kynkyny) Mongoose. He rides a Specialized these days though In the first year the spare bikes were donated by community members too – those were either Merida or Trek MTBs again. Then there was the Moulton, made famous by Georg Leuzinger. I still remember the stares that little bike got. There was Ravi Ranjan’s Orbea and I think that one was the only Orbea that year. Nelly was on his Specialized Allez and I think Dickie Saluja was riding a Bianchi. Not sure which bike was Siva riding that year. The second year of TFN saw more road bikes than MTBs. There were Trek and Merida road bikes this time. The couple of interesting bikes were Suma’s Motobecane, Shay Mandel’s bike – I think it was a Israeli make. Chivas Regal was probably on his Lemond that year (Siva got upgraded from Siva to Chivas Regal on that ride) Dr. Bhateja was on his Merida road bike, Sridhar on a Cervelo, a couple of Bianchi’s, Colnago again – Mr. Bhaskar Rao and Anand Mulky, and there was a Surly too – that lady from Hyd. It was a nice black Surly with bar end shifters and a leather bar tape (?). 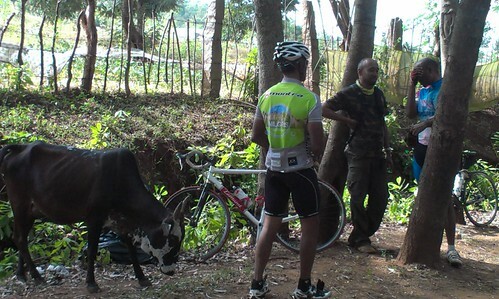 Then there was Mr. Alex on his Trek 4300, Muthu on that full carbon Giant. I think that Giant is on its 4th TFN now – 1st with Muthu and 3 more times with Arun. There was that classic Italian Fanini bike, a steel beauty. I still remember the cranks on that bike.. they were pieces of art, in steel. If you meet one Mr. Arun D’Silva you should ask him about it. That year we had several hybrids as well – Trek 7100, Cannondale Quick 5 (Anita, Nischal, Reena, Yogesh), Venkat (CW founder) on his blue Giant. 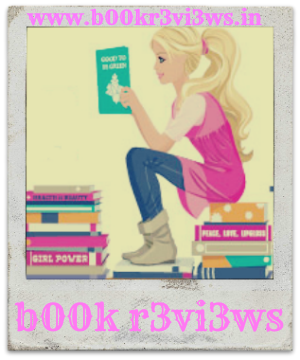 Third TFN – couldn’t go. Didn’t have enough leaves from office. The B’Twin Sport 1 bikes were available in the market by then so I am guessing a few of those would have made it to TFN as well. In the fourth year of TFN we had Rajesh’s Pinarello, Mark’s Neuvation, Sreekanth’s Specialized S Works, a Litespeed with Mavic R Sys rims and carbon spokes – yeah they were carbon spokes and super light, Venky’s Bulldog, Chivas Regal’s Scott, Dr. Bhateja’s Look (with Psimet wheels? ), Akshay’s Pinarello, Jeff’s steel bike, Hari on his Italian steed – Willier, a bunch of Cannondale’s, Bianchi’s and Sport 1’s, one or two Orbea bikes and the usual mix of MTB’s and Hybrids. We had Specialized again – Erik and I think Sumit Pal too. I’m forgetting what was Guadzilla’s bike.. I think it was a Ridley. Then there was Cycle India’s blue color bike too. Again, I am forgetting what it was. Chacko Cherian had that carbon Scattante. Last but not the least we had Sandeep’s all steel Bianche Volpe. This year we have a few interesting bikes on the TFN – Gazelle (the owner now wants a Van Nicholas though), Guru, Focus, Scattante, LeMond, few Scott bikes, Pinarello, Lapierre, Bergamont, Specialized Roubaix, Trek 1.5 (white and green – this is the 2nd Trek white and green to do a TFN. The first was in 2009 and the rider was Anand Avati. I know this because this one is a very rare model to find in these parts. There are only a handful of these). Trek Domane and Trek Madone, both. There is a Kuota on tour as well. Manish’s Look is doing its second TFN (first time it was ridden by Muthu Kumar). To conclude let me share my personal feeling about a bike…. when you buy a bike… get a great bike. Save up for the bike and buy the best you can afford. With my experience I have seen a great bike can do much more to you than you can do to the bike. This is very much unlike a car or any other expensive purchase. A bike changes you as a person. Always get the best. Overheard over Lunch: Cycling is suffering, some suffer at 50 and some at 20 km/hour, but all are suffering. It may have been quite but it definitely wasn’t quiet on the inside of the rider camp. For more rider inside stories don’t forget to read Venky’s Monkey Musings Day 5. The British Royal Mail first started using bicycles in 1880; now bicycle delivery fleets include 37,000 in the UK, 25,700 in Germany, 10,500 in Hungary and 7000 in Sweden. A rider is said to have ‘Bonked’, ‘Cracked’ or ‘Hit the Wall’ when he completely runs out of strength or energy on a long ride. The Beacon sponsored GPS Trackers will help guide the cyclists along the proper route and help organisers identify cyclist locations through out the Tour of Nilgiris Cycling Event. Today from coffee plantations we ride on into tea estates leaving behind Kerala to enter Tamil Nadu at Gudalur on our way to Ooty. Something I love about going to Ooty is the change in air. Just as you cross Gudalur the sun gets warmer and the air cooler. There is a certain bite in the wind that brings a flush to my cheeks. Oh I love the blue hills. The roads here were in great condition and we had a ball charging down them as we tried to catch up with the riders. Its a climb but nothing compared to what was coming ahead past Guladur. We wove through the mountains and watched the coffee plantations change to tea estates; we were in tea country. With a quick stop at SS1 we headed out to catch up with the lead riders before the competitive section 13 km ahead. Today was a day to capture the starts at the CS. Positioning ourselves we settled down to watch the riders start-off a minute after each other. Some of them struggled up the climb and some of them just shot off like Usain Bolt. Leaving after a few riders had started hoping to capture them on the climb we headed up and I soon saw the sound reasoning behind the shedding. Every little gram would count on this climb as the roads switched around and about the mountains constantly and relentlessly climbing up towards Ooty. We got dropped of in the middle of the CS and Che settled down to take some tea inspired photos while I took in the views and caught-up with the riders. Watching them it was clear that it was a struggle but these guys seemed driven to take it on, it was a challenge and they weren’t stepping back. I don’t know if the riders feel this way about it but to me it definitely seems so. We headed out towards the end of the CS after alot of riders had passed to grab lunch and watch a few finishes. The riders who had reached the end had relief on their faces as they wolfed down lunch. But that relief was to be short lived as there were still some walls to be climbed in the 31 km left before they arrived at Sterling Fern Hill Resort, the stop for the next two nights. It had been a long day, great roads and views but at a steep price. On the way up to Ooty and the hotel we ran into Malik who was fixing a puncture. Soon the air was filled with raucous laughter as Che and Chethan joined Malik, showing skills beyond the camera. It was a fun stop with photographers and cyclists joining hands over a wheel. Tomorrow is a rest day, a day to recharge and explore Ooty. Ooty has a lot of history both indigenous and British. The Nilgiris has challenged many a man over the centuries. One of the first Europeans who undertook the gruelling climb to meet the indigenous Todas was Father Fininicio, a Jesuit priest in 1603. Over the years after that the Nilgiris saw regular expeditions but construction began only in 1822 when John Sullivan, then Collector of Coimbatore built the Stonehouse in Ooty and brought his wife and son to stay. Today the Stonehouse is the administrative building of the Government Arts College. There is a lot that riders can see and do in Ooty but I have a feeling a lot of them are just going to put their feet up and catch up with friends. But the action doesn’t stop, tomorrow is the Entrée, the special offer this year for those who coudn’t make it to the full tour of TfN. Its going to be a lot of walls tomorrow! Alright then, so long, see you on the other side. And as always don’t forget to read Venky’s rendition of the climb today. The word bicycle was coined by the Belgian newspaper La Gaulois in the 1890s. Before that, and in some places thereafter, bikes were known primarily as velocipedes. The peloton (field, bunch or pack) is the main group of riders in a road bicycle race. Oakley, Inc. is a sport and lifestyle brand, driven to ignite the imagination through the fusion of art and science. As the undisputed leader in performance eyewear, Oakley continues to advance sport technology and redefine the lifestyle market with patented optical innovations. Today we were headed up and down and up to Sultan Bathery before the climb up to Ooty. The first 40 odd km of the day were really bad roads so the bikes and cyclists got transported to Gonikoppal. It was just 40 km but it took us almost two hours to cover the distance. Rolling hills of coffee plantations with valleys of golden paddy are beautiful but when terrible roads bounce you all about, the beauty gets marred a bit. Getting down from the jeep to stretch at Gonikoppal had me wishing I was a dog. How I wish I could have just shaken off all that dust we were covered with! The riders were picking up their bikes and unpacking them while I stood by to watch. And I got to see my first quick tube change. It was fun to watch Venky change his tube in no time at all, as if a puncture is nothing. With a late start from Gonikoppal at 11:30 the riders headed out towards Kanoor, the first SS and lunch stop about 15-18 km away. This was still bad road, just, better than before. Today was a testing day for road bikes, the MTB guys might have had some fun though. A little beyond SS1, at Kutta the Wayanad Reserve Forest starts and in this 20 km section cyclists had to stay in groups with instructions to not stop in the forest but ofcourse there was an exception. 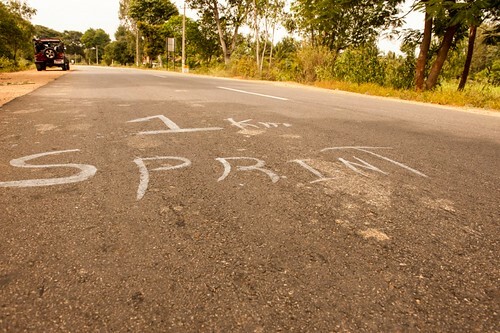 Cyclists left SS1 in groups headed into the second largest santuary in Kerala that covers over 345 sq. km. and houses a large variety of flora and fauna. And then they stopped right in the middle of the forest for some unniappams and sulaimani chai (black tea). This was a stall at a juction in the forest, that I had heard alot about and was looking forward to. But Alas, I didn’t taste the unniappams. I grabbed a chai hoping to come back later with the boys for some unniappams but we rushed off to shoot pictures of the cyclists in the forest and I forgot all about it until later. Making a quick stop at SS2 to check on the cyclists ahead of us, we left for SS3 at Panamaram which was the lowest point for today. Until here there had been a fair number of downhills to enjoy but after this the last leg for today was hugely uphill to Sultan Bathery (town gets its name from Tipu Sultan who used the abandoned Jain temple here as his battery in the 18th Century). It had been a testing day but this last stretch pushed the test some more. Not that I saw any cyclist complain, they did groan but then got right back on the cycle to suffer some more. With a late start, it was a rather long day today and the first cyclists reached the hotel in Sultan Bathery only at 4:30. When we reached at 5:30 there were still more cyclists to arrive. The last few reached at 6:30; Kudos to them for shear will-power. Today’s been a long day, not in distance but definitely in time, effort and endurance, and it doesn’t end here. Tomorrow is the 99km climb up to Ooty and I’m looking forward to it. See you at the top tomorrow. No CS, No Results. Top 3 and timings same as yesterday. Don’t forget to check out Venky’s Update on how the Riders fared today. In 1899, Mile-a-Minute Murphy (Charles Minthorn Murphy) became the first man to ride his bicycle a mile in under a minute. ‘Yard Sale’ is a crash causing every piece of gear to be scattered all over the place. The resulting scene is reminiscent of a yard sale. LinOpinion is the Public Relations division of Lowe Lintas India and provides brand image consultancy to leading MNC and Indian Companies. As is customary, to satiate his sweet tooth Chenthil found awesome kulfi last night. There’s something weird about this sentence but it still seems so right, hmmm, anyway… Che heard of a food street just a short distance away from the hotel and we being we, we headed off there to grab a bite while we waited for dinner. And it was a treat, we had some hot crackling crisp dosas with a chutney that left you wanting more. Since no meal is complete without dessert we looked around to see what everyone else on the street was eating and headed to the kulfi guy. 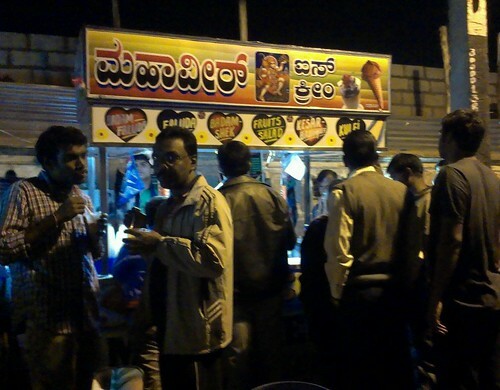 Now I like good kulfi and its been a while since I’ve found good kulfi in Bangalore. This was not good kulfi, it was awesome. Rich and creamy with flakes of badam and pista in every slurp. This kulfi you should not miss. The second day of the ride arrived all bright and sunny and at 8:15 there was an uneventful flag-off (uneventful is a good thing). The riders headed out towards Hunsur accompanied today by Mr. Bhaskar Rao, IG (internal security) who was joining the TfN riding pack for the day. I had read up on Hunsur while prepping for the trip and was looking forward to see the town that was historically a resting station for bullock carts and hence called ‘Gaddi Palya’. But I was sorely disappointed, there was no air of gaiety, no colourful bullockcarts, Hunsur was a town that I hardly noticed as it passed by. My romantic mind felt so let down. We did run into a road-side wholesale saabzi mandi a little later though. We’d made it to the CS start before the riders, which was great because now we could position ourselves well to watch and take pictures but not before a quick bite. My favourite dry fruit of all time is the fig. Its great in its fresh form but in its dry form it has this amazing texture, a soft crunch, chewyness and this awesome sweet taste that just seeps through your mouth with each bite. I’ve never come across anything else that good, ‘never’ until this afternoon that is, when I tasted honey-dried bananas. The SS3 at the CS start point had these dried sticky succulent banana bits that were not dry fig but I think I just found a contender. Well past Kushalnagar we were now in coffee country, Coorg. The temperature dropped and the views got scenic as we left the start point to find a good up-hill corner to capture the ‘suffering’ It is a lot of hard work climbing up this hills with just your legs to power you but these guys seemed to be enjoying the suffering. There was this expression of euphoria that everyone of them had, every one of them, like cycling was a high. Todays competitive section was a climb from 950mts to 1400mts within 10 kilometres. That’s a touch section that does have downhills but it’s a constant uphill climb and a fast ascent at that through winding coffee and pepper plantations. Oh yeah the boys did well, did you even have to ask? We got to the CS finish to find a lot of riders had already checked in and were even almost finishing lunch. God if I had cycled up that hill I would have already finished lunch. (sorry, I know sad humour) Anyway we had lunch as we watched more cyclists race in to finish the CS and grab their well worked for lunch. With Madikeri just 10 odd kilometers away no one wanted to idle around at the support station, so along with a lot of cyclists we headed to the stop for the day. Coorg is beautiful with rolling hills filled with green forests and coffee plantations, so I’m not going to idle here anymore and I’m going to be off enjoying the daylight left. Not that writing this post was idle in anyway, oh!, you know what I mean. Ok, I’m off, see ya tomorrow…. You can read Venky’s Rider Report for Day 2 here. Every year since 1977 the winner of the Paris–Roubaix receives a sett (cobble stone) as part of his prize for winning this cobbled classic. Slopestyle, a form of downhill, is when riders do tricks such as tailwhips, 360s, backflips and frontflips. The Pune-based Widget Factory Software Pvt Ltd has its roots in the US-based Libson Inc founded by Joseph Libson, with deep expertise in the banking vertical. Established in India in 2000, the company provides end-to-end support for online and mobile widgets. Yesterday at the pre-tour brief I met a lot of TfN riders and they looked just like normal people, like just about anyone I know, not like ‘riders’. But today morning at 5:30 I met the real ‘riders’ at Sullivan Grounds. All geared up they turned up with their cycles on time to get fitted out with the Beacon gps trackers. There were a large variety of bikes out there but there was not one I could recognise yet. I could tell the difference between the road cycles and MTBs but thats as far as the theory seems to have taken me. Lot more to learn, yippee…. At 7:15, after tagging, numbering and breakfast the riders assembled for flag off. The chief guest Mr.Bhaskar Rao, IG (internal security) said a few words followed by Mr. Katti, DGM, Bangalore division from SBI. This year SBI is sponsoring Arun Marc DSilva who is one of the four charity riders cycling for a cause. Post some tour announcements it was flag off time. 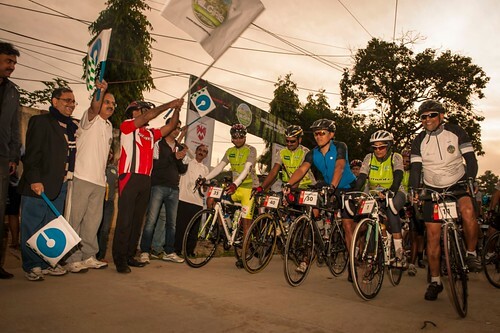 Mr. Bhaskar Rao flagged off the riders at 7:45 and they took off towards NICE expressway while we gave chase. Cutting across the city would be difficult even on a Sunday morning and we wanted over take the cyclists and wait for them to enter the NICE road, so off we went. And it paid off; the entry to NICE is a beautiful curved climb-up and it was a joy to watch the riders pack climb lined up in a train of colour. Leaving the NICE expressway that was a nice treat to ride especially since cyclists are not allowed on it on regular days, we headed towards Harohalli and Kanakapura the first rest stop. The riders were making good time and I couldn’t help but be amazed at how fast the human engine can go. By 10am the first riders had started to report in at Support Station 1. A quick stop for a snack and they were off again towards Halaguru to start the first competitive section of TfN 2012. We hung about a bit to see more riders arrive while I took in the Kanakapura air. Its been almost three years since I was last here. Kanakapura is a quaint little village-town that has not only great bene (butter) dosas but also a long history. It is a town that was burned down twice by Tipu Sultan to hinder the British in their march to Shrirangapattana. Remains of the twice burned fort can be seen by the bridge over the Arkavathy river which is a tributary of the Kaveri and also supplies almost 20% of Bangalore City’s water supply. Heading out we sped up to get to Halaguru before the riders. Today’s day on the tour is the longest in terms of distance but shortest in time and effort. Its all flats today I’d been told but there was nothing flat about the gentling undulating terrain. Bordered with the green of winter the road reminded me of the soft ripples on a silk saree teasing you to smooth them away. The riders seemed to be enjoying the ride as they coasted along in groups. One group of four riders in file were even having an animated all out discussion! At Halaguru we met up with riders getting ready to start the competitive section(CS). Not wanting to miss the finish of this CS we hurried to Malavalli 16km away where the section would complete. We set up cameras and along with the timing team, we settled down to wait to the first rider to show up. And man did they show up fast. The first rider took just 21-22 minutes to finish the section! Before we knew it a large number of riders had zipped past us to the rest stop and were relaxing there waiting for lunch. The section after Malavalli towards and around Bannur has terrible roads with not potholes but moon craters, so it wasn’t surprising to see riders wanting to be over and done with it as soon as possible. 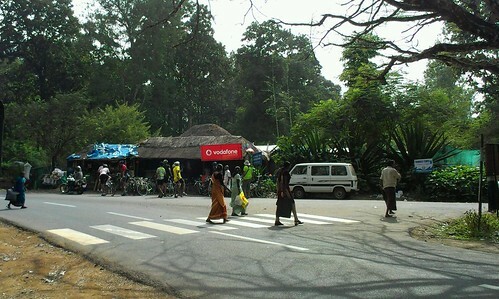 A few riders decided not to wait for lunch and headed out towards Mysore and the last rest stop. Read more about Day 1 in Venky’s Rider Report. The most exotic road bicycles can weigh as little as 3.2 kg. The highest priced bike in the world is the custom Madone by Damien Hirst, sold at $500,000 USD. 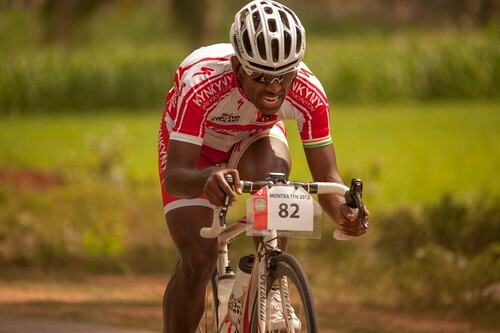 A brevet or randonnée is an organized long-distance ride where riders attempt to complete courses of 200 km or more within specified time limits. A rider who has successfully completed a 200 km brevet is called a randonneur. This is a lifelong title! Spectrum Physio Centre was founded by Dr. J. Dhanajeyan M.P.T., who has been practicing physiotherapy and rehabilitation since 1999. With almost 10 years of service to society they are experts in physiotherapy and rehabilitation. 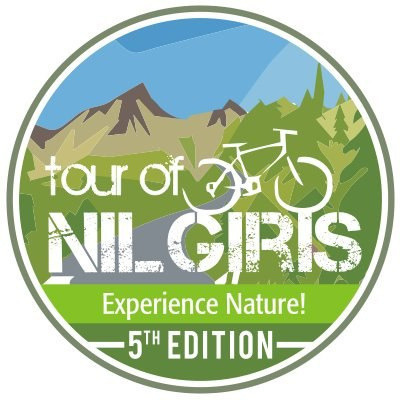 TfN (Tour of Nilgiris) starts off today or rather by the time you see this we would have started out and will be well on our way to Mysore. Watch out for todays update towards evening (if the internet gods are willing that is). 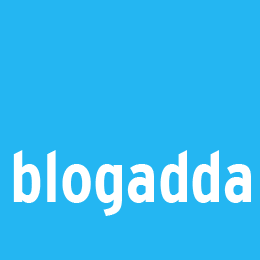 Don’t forget to follow Venky on his blog Venky’s Monkey Musings and More.. for more TfN updates. 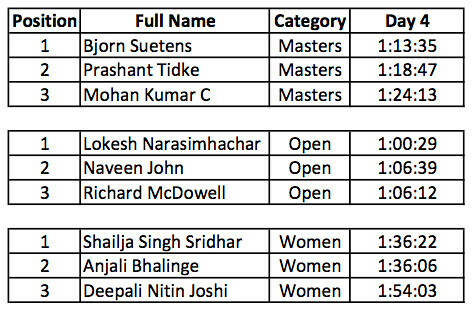 Now here’s some totally random trivia about the riders in Tour of Nilgiris 2012. A total of 85 riders will be at the starting point. 9 of them are women riders. Only 1 out of 9 women is from Bangalore. There are more riders above than below the age of 35 – 46 vs 37. The youngest rider is 21 and the oldest is 56 year old Renu Mittal. 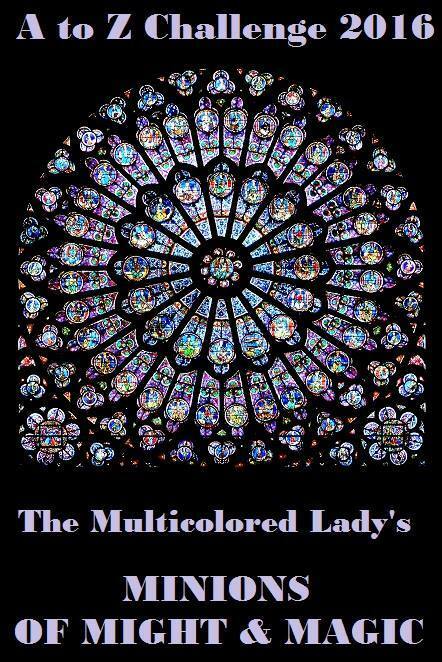 The nationalities other than Indian are American, British, Flemish – Belgian, Dutch and Swiss. The three top cities riders have come from are Bangalore (33), Pune(11) and Ahmedabad(11). The largest blood group present is ‘O+’ (36). The most popular type of bike being used is the Road bike (61), but there are also 18 Hybrids and 4 Mountain bikes. The three most popular manufacturers are Trek, Cannondale and Bianchi. 400km is the longest ever day ride done by the riders at TfN. 3 volunteers from TfN 2011 will be cycling this year. 12 riders have participated in a previous TfN. Non-vegetarians(53) are the majority group this year on TfN, followed by vegetarians(22) and eggetarians(8). The last two weeks have been a lot of theory and numbers as you’ve seen in my last few posts (sorry for that). Now it’s time to try out the theory in practice and meet the numbers – the riders and their cycles. See you in the evening.